Metal Gear Solid: Peace Walker will include a large amount of in-game cross-promotion, but Hideo Kojima says this is just to keep things fresh. At a Metal Gear Solid: Peace Walker completion ceremony this week, Hideo Kojima not only detailed that he feels consoles are dying, but also a somewhat excessive amount of in-game promotion planned for the upcoming PSP game with multiple different brands of food, deodorant, and magazines. When taken to task for the product tie-ins, Kojima defended them saying they're different from what is being done in other games. The promotions, detailed by Andriasang, involve many real world products from Japan. 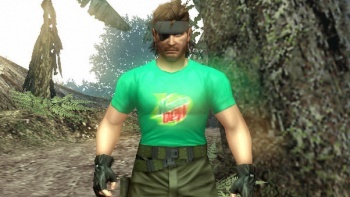 Mountain Dew and Pepsi cans are health recovery items in Peace Walker, and certain Metal Gear branded Mountain Dew cans from a convenience store chain will include a code that can be inputted into the game to give Snake a Mountain Dew t-shirt. Other retail chains in Japan will distribute codes for more unique shirts. Snake can also eat Doritos and apply Axe deodorant to raise his health, listen to Sony Walkmen from various eras, and many popular Japanese magazines are tied into Peace Walker as well. Metal Gear has featured real-world items such as iPods in the past, but this list is quite exhausting to say the least. Due to a furor on Twitter, Kojima has defended the tie-ins, tweeting: "Regarding the collaborations, I have one reason for doing them. It's because I want to surprise the players. If the surprise and freshness were lost, I would stop the collaborations. It's different from Hollywood-style merchandising." Picking up Mountain Dew and wearing lime-green t-shirts to me feels different than pasting posters for products all over an in-game building, so Kojima may have somewhat of a point. Metal Gear has always been a series marked by both very serious and very silly situations, and these in-game promotions certainly hit on the silly side. They're certainly better than equipping players with a Mountain Dew AK-47 or tasking them to take down a Metal Gear Rex painted like a giant Dorito. It is not yet known if Peace Walker will bring these in-game promotions to its releases outside of Japan.